In today’s market, it is crucial to stand out from the crowd, and the Pearl 75, from the drawing board of British naval architecht Bill Dixon, is fitted with pod drives—in this case, a pair of ZF 4000-series units coupled to 1,250-horsepower MTU diesels. Along with the computer-controlled maneuverability that this system offers, it also allows the engines to be mounted well aft in the hull to make space for exceptionally roomy accommodations belowdecks. 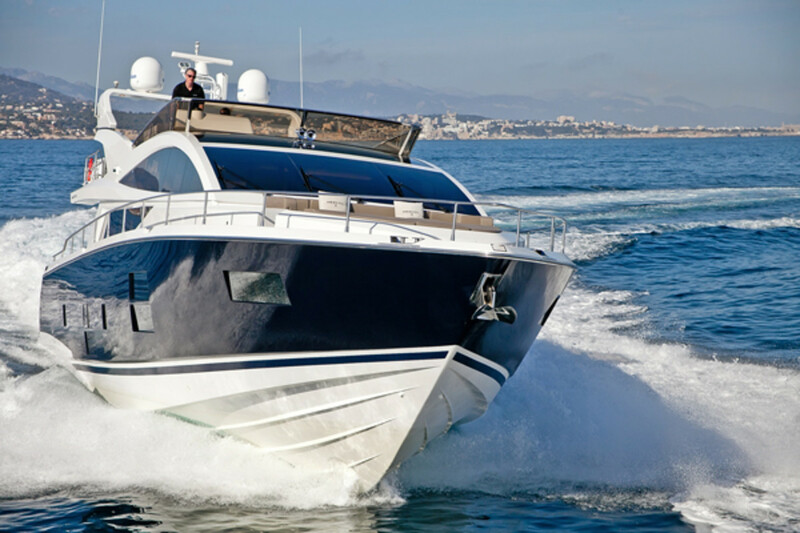 U.K.-based Pearl Motor Yachts steps up its game with a 75 flybridge. It started almost by accident. Pearl Motor Yachts may have been a fixture of the British boating scene for more than 15 years, but founder and managing director Ian Smallridge says he never intended to be a boatbuilder. 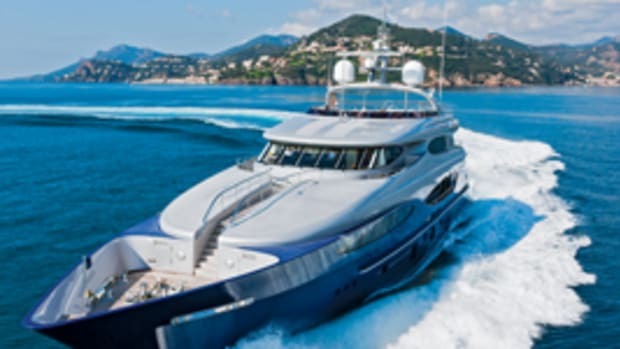 As a mechanically minded superyacht captain whose youthful interest in racing motorcycles led him first to personal watercraft and then to more substantial vessels, he was commissioned in the mid-1990s by a private owner to fit out a set of moldings for a 50-foot (15.2-meter) cruiser. That led to a couple more contract builds from the molders themselves, after which Smallridge, then still in his twenties, acquired the assets of a defunct boat company and decided to set up a business. To succeed as a small player in the competitive British boat industry you need a niche. 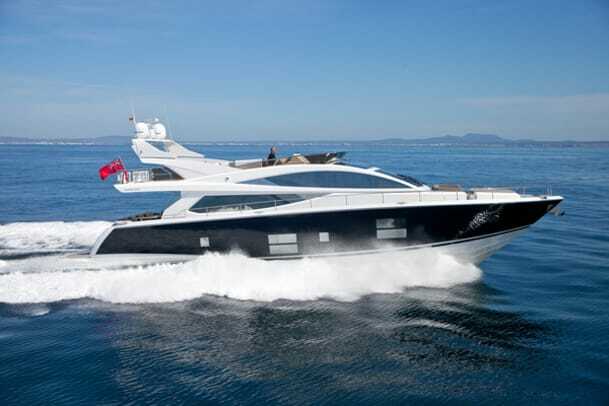 As the big yards chased the Mediterranean market with their flybridge designs, for Pearl that niche was aft-cabin boats, and the company made its debut at the 1998 Southampton boat show with a 45-foot (13.71-meter) model. Smallridge added the Pearl 41 and 43 over the next four years. 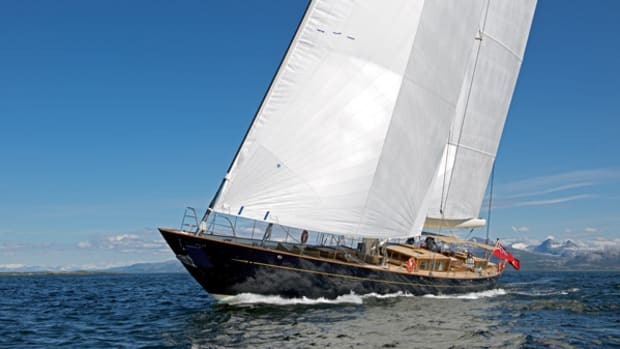 In 2001 he sold his interest in the company to entrepreneur and fellow boat nut Tony Whittaker, who has since played a crucial role in keeping the yard’s finances on an even keel. 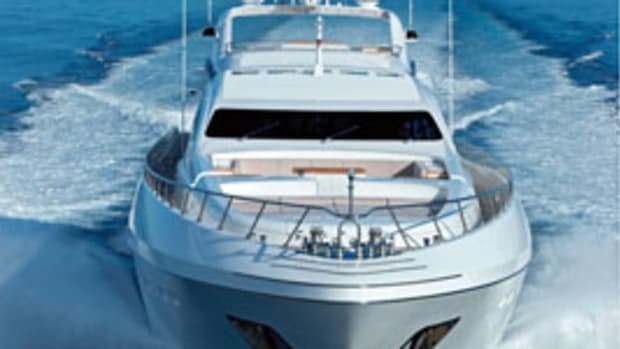 The mainstays of the current range, the Pearl 50 (15 meters) and Pearl 60 (17.8 meters), still are aft-cabin designs, and both are modestly successful. So far the company has built 28 examples of the 60, which started out as a 55, and according to Smallridge, Pearl has delivered eight 50s. 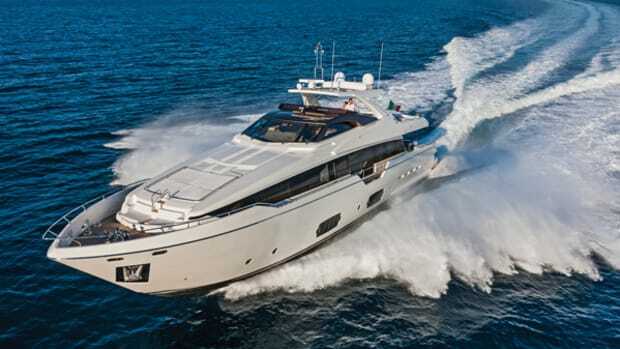 Now he has raised his sights and intends to take on the big boys with this Pearl 75 flybridge motoryacht. We caught up with the man and his new baby in Puerto Portals, Mallorca, and gave the yacht a thorough inspection and an in-depth sea trial. Dixon designed the yacht with an unusually beamy hull. According to Smallridge, the hull boasts a clear eight to nine inches more beam than typical rivals of similar length, which makes a significant difference to interior volume. The Pearl 75’s third trump card is its interior design. 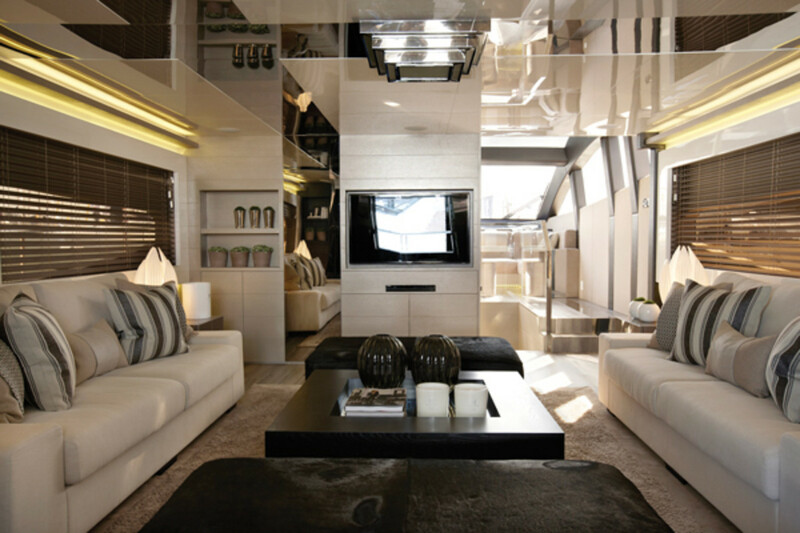 Smallridge and Whittaker drafted interior designer Kelly Hoppen to put her name to the yacht—a bespoke touch virtually unique in this market sector. Based in London, Hoppen lists a number of high-profile apartment projects to her name, although few yachts so far. Her signature style of Eastern-tinged modernism is well-expressed in the Pearl 75, with its monochromatic ambiance, multiple textures and edgy detailing. There are plans to roll out the Hoppen look into the next new Pearl model, a 65, which, like the 75, will also feature pod drives—in this case, Cummins Zeus pods on a triple 600-horsepower engine installation. 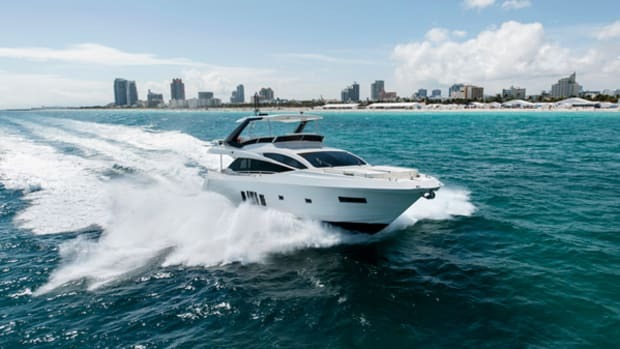 These two new flybridge yachts ultimately will be joined in the catalog by two more, in the 50-foot (15.2-meter) and 90-foot (27.4-meter) classes, and will constitute a separate product line from the aft-cabin cruisers, which the company will continue to produce. “The big brands are so powerful now that you have to do what they do, but do it better,” explains Smallridge, now 43. As well as using designer interiors, Pearl also plans to differentiate itself from the competition with its new flybridge range by undertaking a level of internal customization that higher-volume boatbuilders don’t offer. 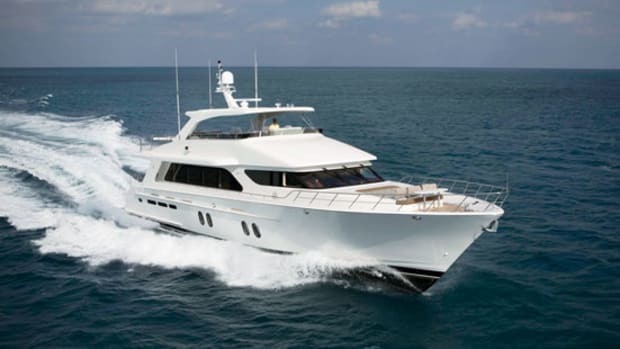 On the 75, for example, this includes alternative layouts for the galley, the option of an enclosed wheelhouse and the incorporation of a dining area into the forward part of the salon. Key to the company’s competitiveness is its unusual construction regime. Pearl is headquartered in Shakespeare’s birthplace of Stratford-upon-Avon, but the yard is based in the historic Royal Navy haunt of Portsmouth Harbour, while mold-tooling, lamination and initial engineering take place in Taiwan. The yachts arrive in Southampton ready and able to make the short hop around to Portsmouth under their own steam. Fit-out and finish are done at Pearl’s Portsmouth facility, ensuring the quality standards expected of a British-built motoryacht. 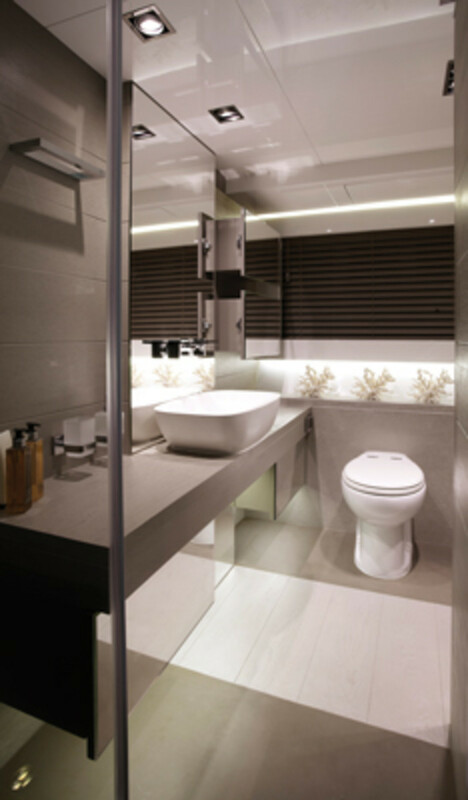 The Pearl 75’s practical, modern and spacious rectilinear layout perfectly suits Kelly Hoppen’s interior design with its subtle use of contrasting tones and textures adding intrigue to various restful shades of gray. Leather and fabric join forces on locker fronts and paneling, echoing the combinations of marble and hardwood used for key floor areas. Dark and light woods add visual depth, while high-gloss, white lacquered deckheads provide a reflective sense of spaciousness. The lacquered wood trim lends a sense of solid quality. Surprising details include areas of flooring picked out in stainless steel. Crocodile-embossed leather bed bases communicate in their faux-reptilian way with ostrich-effect steel locker handles, which in turn provide tactile opposition to the soft leather used for drawer handles. Thick wool carpet provides a reassuring sense of luxury. This first Pearl 75 has an interior scheme that will certainly be too gray for some owners, but there is no denying the conceptual rigor with which the décor has been thought through. And as Pearl is a low-volume yard, you are welcome to talk to the company’s designers about your own ideas for the interior or bring along your own tame creative consultants. 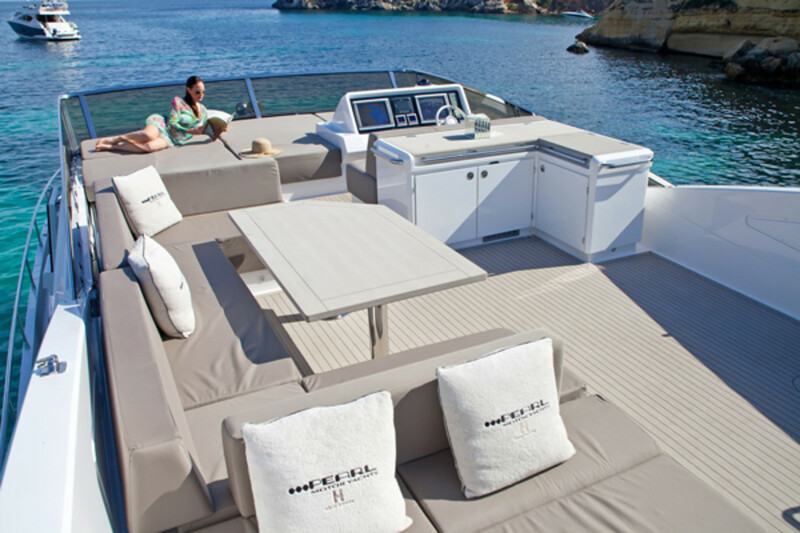 The generous beam of the 75 gives the accommodations a spacious feel. The beds are big, headroom is pretty generous in most areas and the cabins are sensibly laid out with plenty of unobstructed floor space. 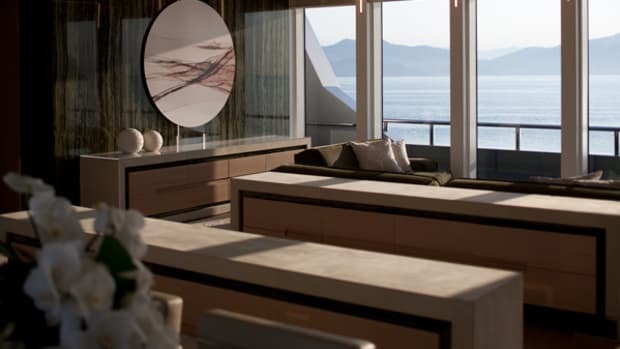 The overhead sweep of windscreen above the wheelhouse and galley is a noteworthy feature, and one reason the salon seems so big is that there is no formal dining table. 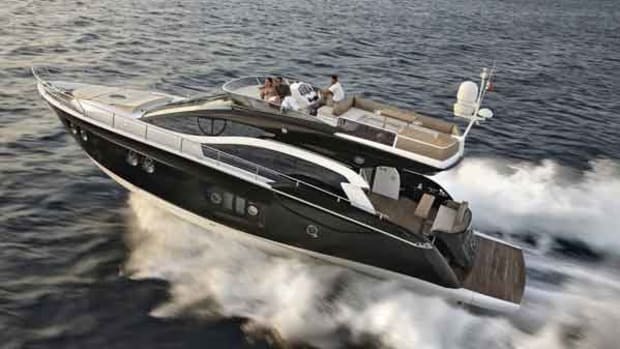 To sit down and eat, you have to be either in the cockpit or up on the flybridge. This will suit owners who like to dine ashore, but if you feel strongly about eating at a dining-room table, talk to the shipyard. Pearl has alternative ideas to offer. 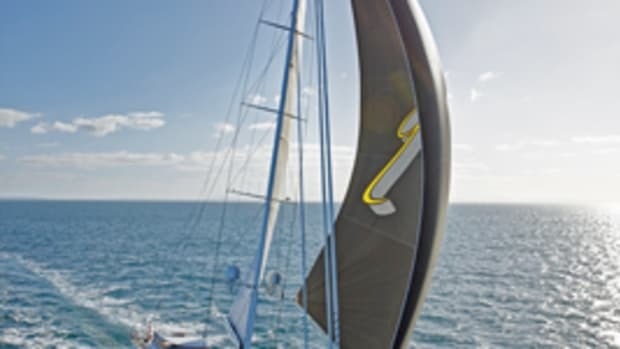 On sea trials, we clocked a maximum two-way average speed of around 29 knots, which suggests comfortable and economical cruising in the mid-twenties. The yacht’s handling was exemplary, and a three- to four-foot chop in no way tested the hull’s seakeeping qualities. I felt that visibility from the lower helm was in need of improvement, and this is due to be changed. The rather tortuous engine room access is also being addressed.